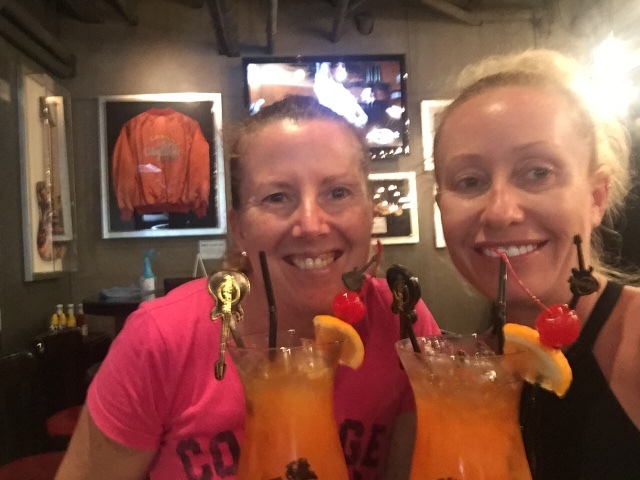 With only one day in Bangkok, we needed a game plan and a tightly planned run sheet. 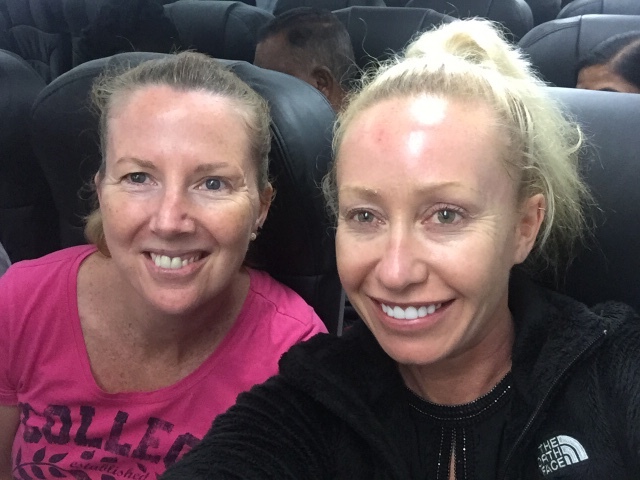 Before jumping on the plane, we, actually I, but let’s not split hairs, mapped out exactly what we wanted to do and came up with the following checklist of our must do activities. So we had a game plan but how did it work out? I booked our Air Asia flights before we left Oz for the bargain price of $80 return for both. Yep you heard right $80. We could have got it a little cheaper if we hadn’t chosen to select seats but at that price we were not going to quibble over a few baht! For a budget airline we had no complaints. Both flights were on time and even arrived a little early. Bonus! We did have two hiccups with our transportation. Firstly the taxi I booked off the street the night before to transport us to the airport did not arrive. For a world renowned party town, Patong is eerily quiet at 4am. There was not a taxi in sight. With few options we put our faith in a strange man that turned up on a scooter and promised to take us to a taxi. We jumped on the back (yes both of us!) and he took us a few blocks away to our savior who got us to the airport on time, despite an unexpected stop at the side of the road for him to get an ant out of his shoe that was biting him! He knew he had us over a barrel so we paid 1000 baht instead of around 700 but what can you do right? The second was that in the fifteen hours since we left Phuket it bucketed down with rain. Our trip back to the hotel from the airport meant crossing a road that more closely resembled a river. We did hold our breath as we drove through the fast running water that was halfway up the door in quite possibly the oldest taxi on the planet. Luckily we got through to the other side without any issues but our driver was not happy! Prefer to go by rail? 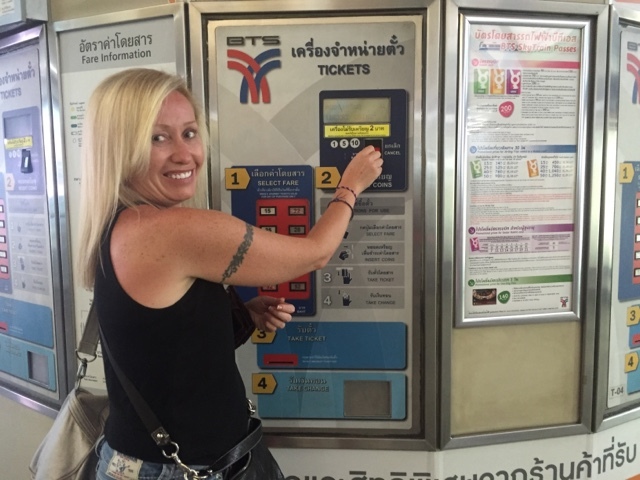 Check out this great guide for all you need to know about Thailand trains. Wow! Chatuchak is huge! One of the largest markets in the world in fact. With 35 Acres, 27 sections, 15,000 stalls and 200,000 visitors every weekend we were never going to be able to cover it all in the few hours I had allocated here. Most websites say operating hours are 9am – 6pm, but the official one says opening is 6am. We arrived about 7.45am and while some stalls were open,most didn’t open until 9am. There isn’t much you can’t pick up here including food, clothing, handicrafts, ceramics, plants, art, pets, book and antiques. 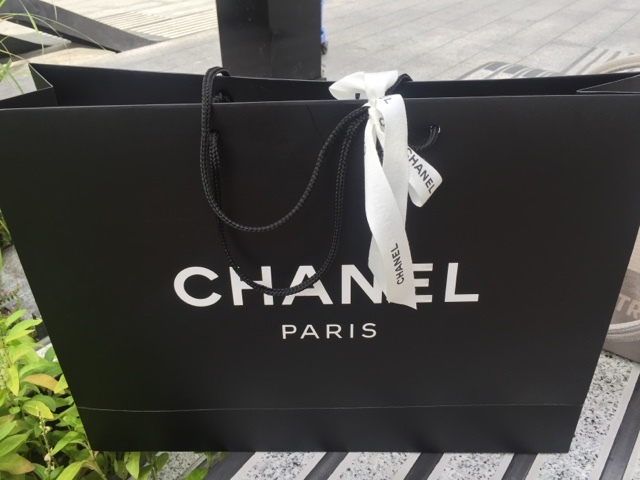 I promise this was only meant to be window shopping but it turned into a little more than that with a very special purchase from Chanel. In my defense I can claim my VAT back to make it slightly cheaper but it still stung a little. What can I say, I love these shoes so much I couldn’t leave them there. You understand I’m sure. We visited EmQuartier, Paragon, The Emporium and Siam Centre. I love Thai food and Bangkok is a foodie haven. I would have loved to have been able to fit in a food tour in Bangkok, but time was obviously of the essence. The next best thing was to sample some of the amazing street food on offer. I know what your thinking. Street food is not the safest of options, but taking a (calculated!) risk every now and then is half the fun of travelling. There were lots of tempting options at Chatuchak, but as it was very early in the morning and my taste in breakfast leans more towards toast and vegemite than chicken satay sticks, fried spicy squid and green quails eggs, so we decided to pass in the hopes that we would pick something up later on in the day. Unfortunately it didn’t quite pan out as the only other options we saw looked decidedly dodgey. To redeem ourselves we did try some delicious crepes from street vendors when we got back to Phuket. A seriously delicious bargain at 60 baht a pop (AUD 2.40). If street food is not your thing why not try one of these vegan restaurants in Bangkok for something a little different. Hark Rock Cafe’s are pretty much the same the world over but this was a MUST do on our trip because I am a hurricane glass collector. This is #49 in my collection and I have drunk the cocktail from every single one of them. An alcohol fueled travel map if you like. I still have three still to collect in Thailand; Koh Samui, Chiang Mai and Pattaya. I’ll be in Koh Samui in March 2019 and Chiang Mai on October 2019. Pattaya will just have to wait a little longer. 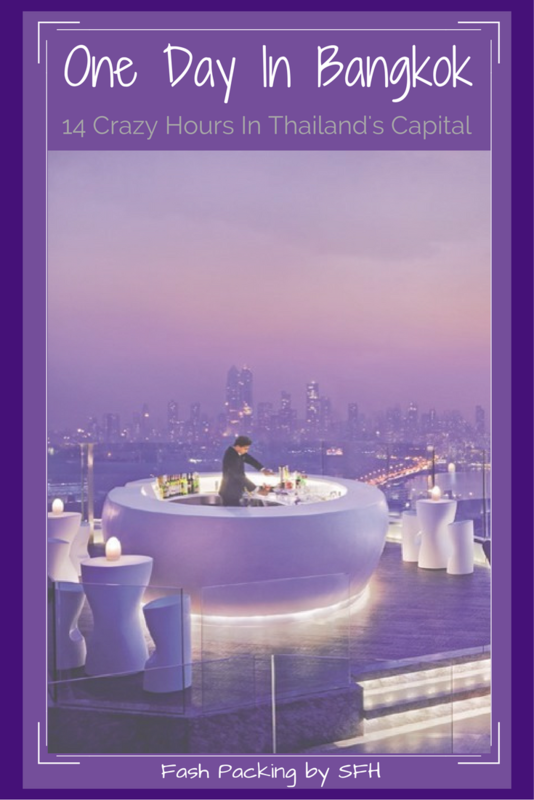 Bangkok is littered with swanky rooftop bars, many of which are situated atop Bankgok’s many hotels. I did some research on a few before deciding on Octave. Situated at the very top of the Marriott in Sukhumvit it has mind blowing views. Who knew Bangkok was so flat? Not me! The wind was blowing but the atmosphere more than made up for it. 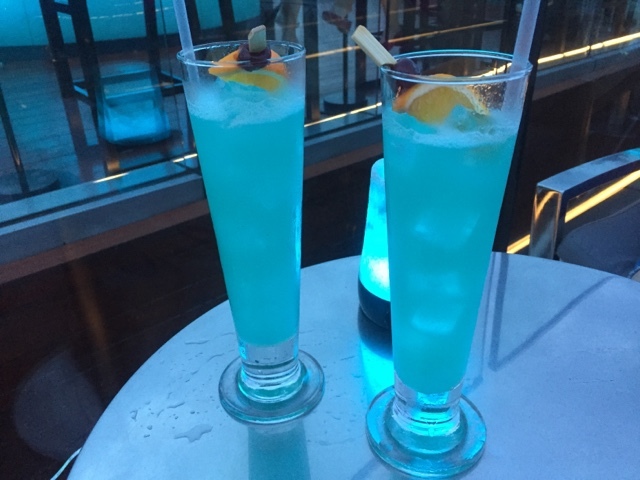 Happy hour on the 48th floor equals two for one cocktails between 5pm – 8pm. The only problem is you can only order food on 45, so it was a choice of cheaper drinks or eat. We chose the cheaper drinks! And they did give us free cashew nuts for sustenance. My travel buddy collects fridge magnets and I always take pens back from my travels for my work colleagues as my ‘signature’ gift (get it?). 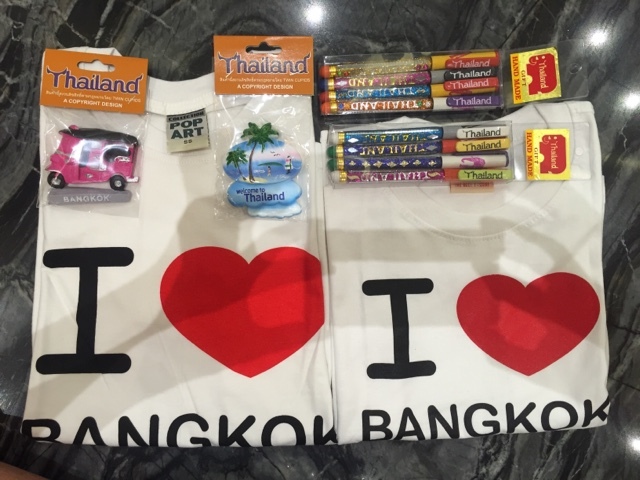 Her daughters specifically requested ‘I Love Bangkok’ T-Shirts. We managed to grab them all at Chatuchak early on which left the rest of the day for the serious shopping! I thought we would be tripping over fish spas during our one day in Bangkok but that was not the case at all. We searched high and low, but couldn’t find one anywhere. 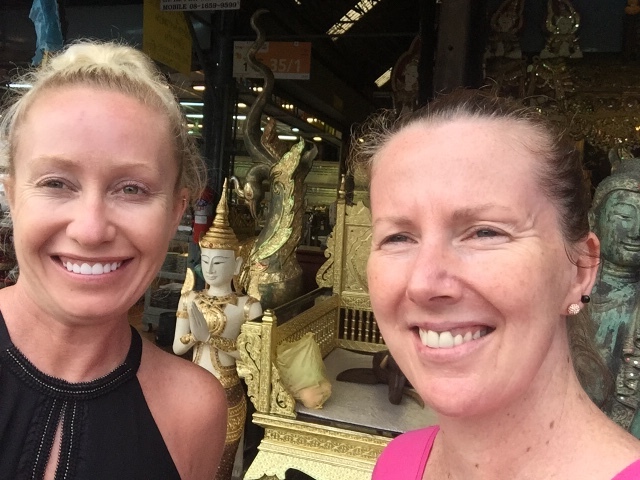 We did find a great little hole in the wall massage place where we got a 1 hour foot massage for 200 baht (AUD$8) which was a suitable substitute and a great way to revive our aching feet! This proved trickier than I thought and I’m not counting the souvenirs above which were cheap as chips. I priced lots of things all which turned out to be more expensive than at home so I couldn’t justify the purchase. Ms 5 requested some nail polish and we found the cutest pink sparkly stuff for just under a dollar, which undoubtedly was the bargain of the day. We also snuck in a sneaky shampoo and blow dry to tame the frizz which at 300 baht (AUD$12) is less than half of what we would pay at home! 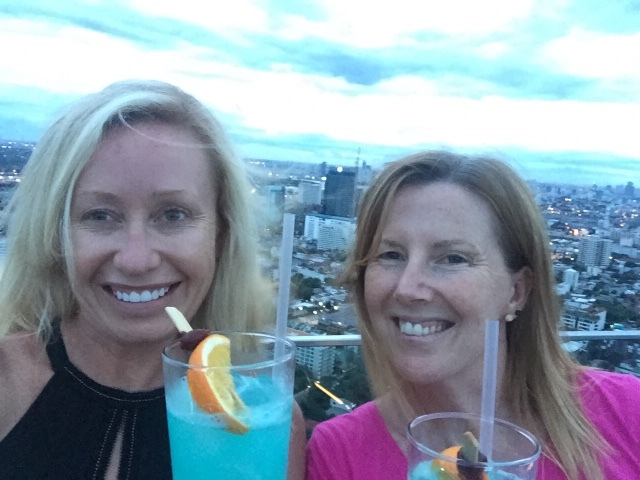 The plan was to take a Tuk Tuk from our last shopping spot to our roof top bar, but they seemed to be very scarce and the only ones we did see were already taken so we started walking. We did stumble on one about a two minute walk from our destination which seemed rather pointless. 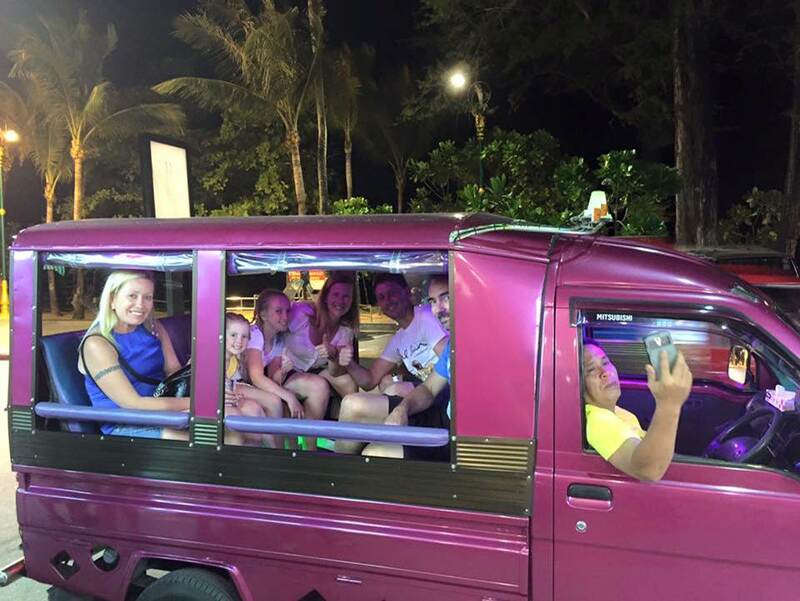 We made up for it when we got back to Patong with the whole gang in tow. The girls insisted on a pink one! If two wheels are more your style, why not try biking around Bangkok. The BTS or Sky Train is surprising easily to navigate once you get the hang of it. 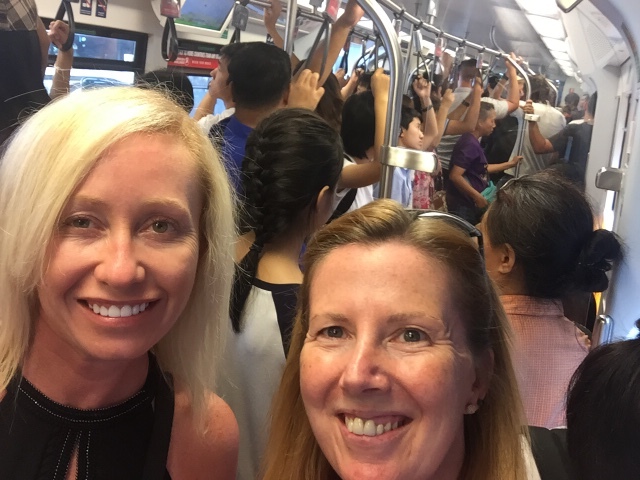 We caught three trains during our one day in Bangkok and each one was efficient and simple, if a little crowded in the city centre. After the first time we even used the automated ticket machines! 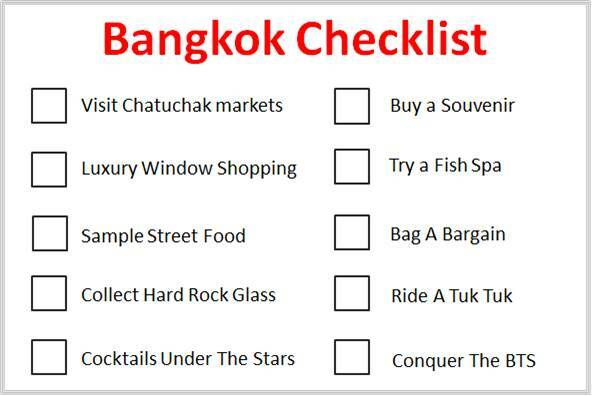 By my count we managed seven of ten the items on our one day in Bangkok checklist although we did tick off two more in Patong. Not a bad effort all considered and we had a fantastic day! If you decide to stay overnight in Bangkok check out these fabulous places to stay in Bangkok. 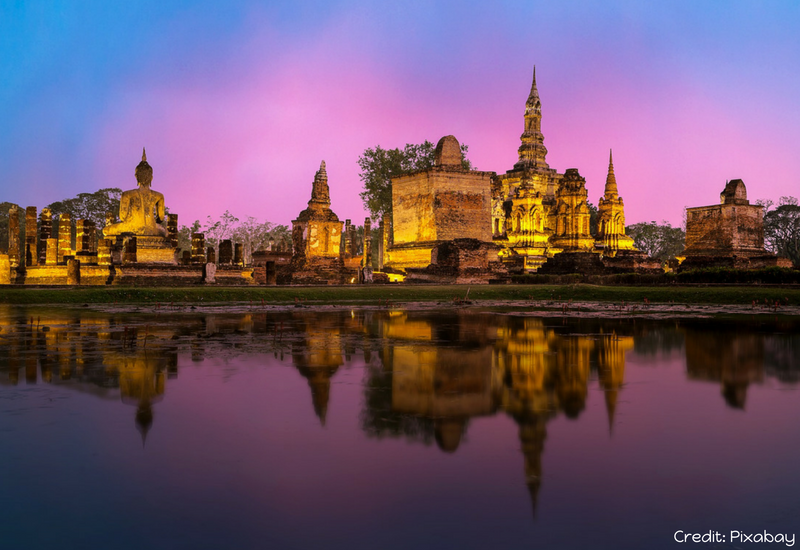 Fill your extra hours visiting a Bangkok temple or two or check out 20 things to do in Bangkok for inspiration. If you are looking to explore further afield try these day trips from Bangkok and those on a budget will love these affordable day trips from Bangkok. I’m sure you will find something to love! What would you do if you only had one day in Bangkok? I’d love to hear your thoughts in the comments below. I love that you can get Air Asia flights around Thailand for prices like $80! 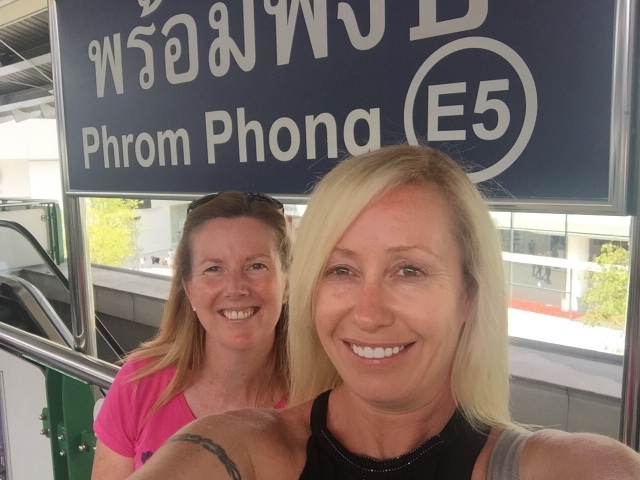 We just returned from Bangkok and LOVED IT! The street food was awesome and cheap! HAHA I love that you and to get a hard rock cafe glass! My husband wanted to get the hoodie because the guy in hangover wears it?! Bahahaha Katie. I have over 50 glasses and counting. Next two in my list are in Cambodia. Bangkok is a very vibrant city with many sights and experiences to be savoured. Can see you had a great time. We were there a couple of years ago and loved it. The night markets, the street food, and tuk-tuk rides were something we really enjoyed too. Of course, we too mastered the BTS and moved around like locals. We had done a bit of temple hopping too. All in all Bangkok is indeed a blast. 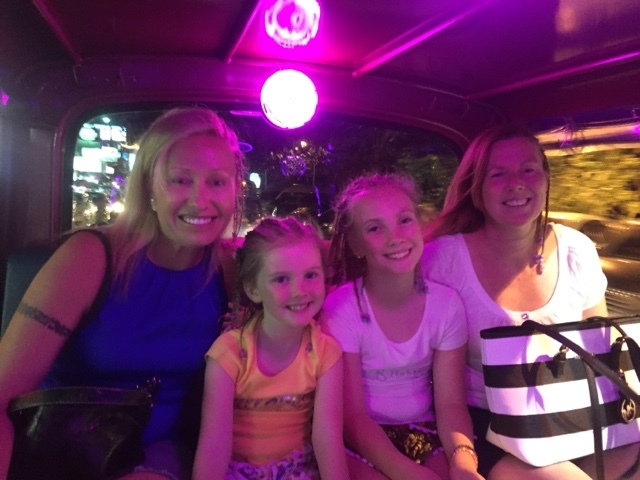 Things like a fish spa and riding a tuk tuk are the signature things to do when in Thailand. Good that you did all this in one day in Bangkok. This means you experienced a lot of culture in just one day. We often have short travel time at many destinations , thus there are a lot of takeaways for us from here. Well you planned a lot and gain a lot, but miss the best part of Thailand. Pad Thai is one of the things you must try when being in Thailand. Thailand is a heaven of street foods, it’s delicious and crazily cheap. If you’re planning travel to Bangkok again, remember to get a food tour. ? I love Pad Thai and have had some fabulous ones just not on this particular day. A food tour sounds wonderful! Wow you got a lot done in just one day! I LOVE that you added that checklist to this… What a fun idea. I might have to copy you 🙂 Thanks for sharing! What a jam-packed day! 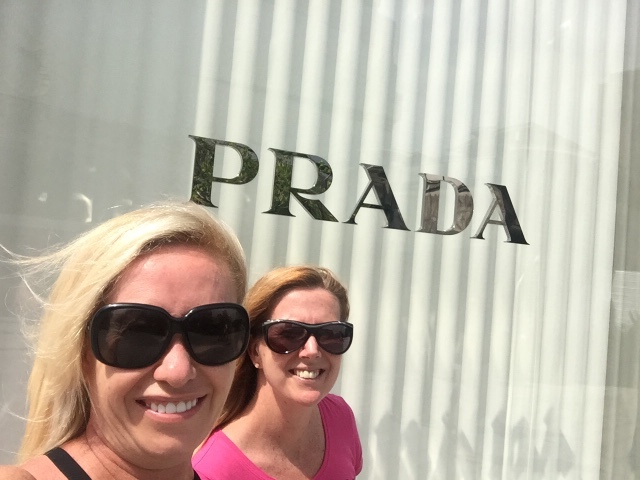 I would have caved and bought something at one of the boutique shops as well! 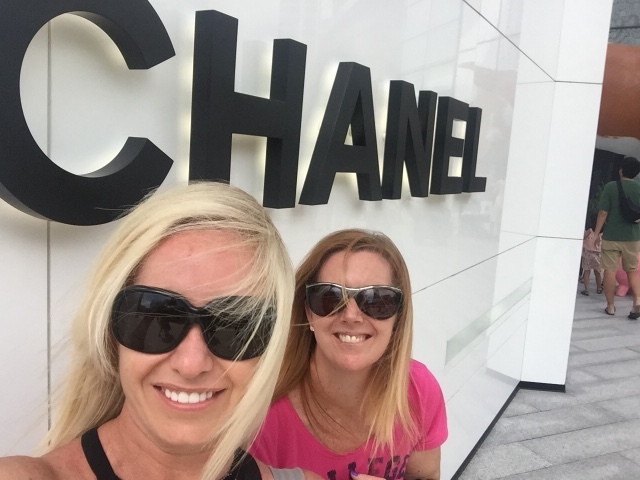 My biggest indulgence was in London at Lulu Guinness – $800 purse 😀 What do the Chanel’s look like? Have you got #50 yet in the glasses? If you not, save it for London as the first Hard Rock opened there and it is still running! We were there in March 🙂 Fish spas freak me out. We had one in Greece and it was so weird. The Chanel’s are gorgeous if I do say so myself. Black pumps with and insignia. I already have London, it was one of the first ones I got and it opened the year I was born 1971 ? We did Natasha. What can I say I love a list! I make lists for everything but we had to be really on pointe here to fit everything in ? haha, as soon as I seen the title started singing the Vevo song One Night in Bangkok to myself! The street food and cocktails under the stars would be my favorite and if I could sneak away from the hubby, a little naughty shopping would definitely pull at my heart strings and send me home feeling sick about the cost, but oh well, you have to treat yourself sometime! Wow, that is great to do all those things in a short amount of time! Bangkok is still on my list but I will definitely take some of your recommendations. I would have loved to had a little longer in Bangkok as we were quite rushed but you take what you can get right Ty. The markets are huge allow at least half a day if you can ? You definitely packed a lot into 14 hours – and that is awesome! Shame you missed out on a fish spa and street food – but I’m sure they would have been readily available back in Phuket. We’ve been to Bangkok twice now and have never got to the giant market – we must really make more of an effort! Exactly Louise. 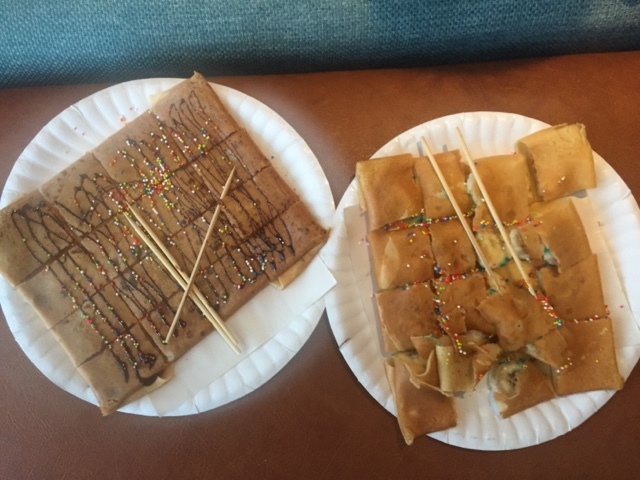 We loved our street crepes in Patong and we might have gone back more than once just quietly lol. The markets were huge, almost overwhelming but one good thing they do is cluster like products together so if you are going for a specific thing you can make a bee line straight for that area. We were happy to wander aimlessly however. I would allow at least half a day to get the most out of it. Wow $80 return from Sydney to Bangkok is such a bargain! Was that a one-off deal or is that their usual ballpark price? There’s so much to do in Bangkok I think you’ve done incredibly well to squeeze all those things into a short visit. Christina it was from Phuket. Still a brilliant price and yes it was a good deal and not standard. We were keen to make the most of our ‘day out’ ? I know Mimi. Would have loved to stay longer but you take what you can get lol. We were supposed to go for three days while we were there a few years ago but the coup happened so we decided just to stay in Phuket. You had me at “One crazy day in Bangkok!” You guys really packed a lot into your short amount of time and your 7/10 is a lot more than many people get done with a whole week in Bangkok!